Wendi, CVT, joined our family in July of 2016. 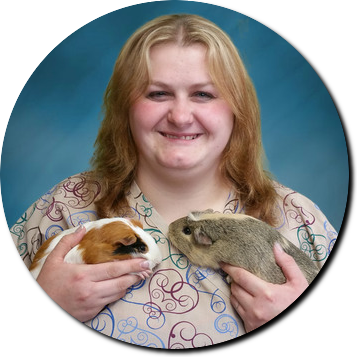 She graduated from the Vet Tech Institute in 2009 and is a Certified Veterinary Technician and also a Certified Poultry Technician. Wendi has a passion for animal welfare and is Vice President of Lawrence County Animal Relief Fund (LCARF), on the Board of Directors of Feline Friends of Ellwood City, and co-founder of Friend of the Feline Cat Rescue. Previously the manager of a large alpaca farm, she is currently the Animal Control Officer for three municipalities in her home area, she volunteers for several animal welfare organizations, and she also transports animals in need to local rescues. Wendi and her husband, Ken, live with their family on a farm where she enjoys caring for a wide range of dogs, cats, horses, alpacas, and poultry. Her hobbies include hiking on nature trails and horseback riding. Amanda, CVT, is a lifelong resident of Pittsburgh and grew up in Mt. Washington. She graduated from the Vet Tech Institute in 2014, and passed her boards to become a Certified Veterinary Technician shortly thereafter. She started her career in shelter medicine and eventually transitioned to private practice. Amanda is a proud mom of three dogs: Precious, Tank and Misty. She adopted Tank from VTI while she was in school and he has been her soulmate from the first day they met. She also has a feral cat named Smokey who joined the family in 2017. Amanda has a passion for dermatology and dentistry. Outside of work she enjoys music, movies, going on adventures with her pups and attending live concerts. Alyssa is originally from Illinois, but she is currently living in Moon Township. A 2019 graduate of The Vet Tech Institute, she will be taking her boards soon to become a certified veterinary technician. In her free time, she enjoys music, movies, playing sports and spending time with her friends. We are very pleased that Alyssa has chosen to complete her externship here at Middle Road Animal Clinic!